Georgia-based startup combines education on media literacy with original content to provide a full-service solution to media misrepresentation. We would like to congratulate Tony and the Weird Enough Productions team on their victory, we look forward to seeing them again in the 2019 FETC Expo Hall, and we’d like to invite all innovative EdTech companies to join us next January in Orlando. "I'm glad that we were able to bring media literacy to the forefront of educators’ minds. In the age of fake news, students need a way to healthily engage with media content,” said Weaver. “Everything that we're teaching students about coding and technology will be for naught if we do not first equip them to deconstruct the media images they're bombarded with daily. I was humbled by the opportunity to participate in the competition and even more grateful for the chance to share an issue I'm passionate about with education industry leaders." Exhibit space is now available for FETC’s 39th annual event, to take place January 27 - 30, 2019, at the Orange County Convention Center in Orlando, Fla. The 2019 Expo Hall will expand in size, enabling even more exhibitors to participate. 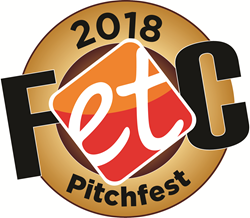 The 2019 FETC Expo will once again feature the FETC PitchFest competition and the Startup Pavilion, a designated area to learn about the newest companies emerging in the EdTech marketplace. To learn more about exhibiting opportunities and reserve your spot, visit fetc.org/exhibit. The Future of Education Technology Conference (FETC) annually attracts thousands of education and technology leaders from around the world. Delivering strategies and best practices for student success and schoolwide advancement, FETC is known as one of the nation’s premier education technology events. Recognized for its outstanding program year after year, FETC provides CTOs, CIOs, Innovation Directors, Special Ed/Pupil Services Directors, Early Childhood Directors, Media Specialists, Technologists, Administrators and other Educators, the opportunity to explore the most effective integration of technology across the curriculum — from PK-12 — through premium sessions, intensive workshops, various concurrent sessions, live demonstrations of several hundred hardware and software products, plus much more. LLC LRP Conferences, LLC, an affiliate of LRP Publications, produces more than a dozen professional conferences and trade shows annually including: Campus Technology Conference, Ergonomics Conference & ErgoExpo, Future of Education Technology Conference (FETC), Recruiting Trends Conference, Talent Acquisition Tech Conference, and Women Leaders in Education Conference. LRP Publications, founded in 1977 by Kenneth Kahn, is a broad-based media company serving business and education professionals. Specializing in the fields of education administration, education law, education technology, federal employment, human resources, workers' compensation and disability, the company publishes hundreds of books, pamphlets, newsletters, videos and online resources on various topics including Title 1 and Special Education. Additionally, LRP publishes two industry-leading magazines: Human Resources Executive® and Risk & Insurance®, plus delivers top-quality training and professional development with eLearning, conferences and tradeshows including: HR Technology Conference & Exposition®, National Institute on Legal Issues of Educating Individuals with Disabilities®, National Workers' Compensation and Disability Conference® & Expo and dozens more. For a complete list of LRP products, eCourses and conferences, please visit http://www.lrp.com.